Tibetan Tea, Herbal Tea, Butter Tea, Tibet Tea Recipe, Tibet Tea Bowls, Himalayan Tea, Online Shop,Dharamsala ,Dharamshala, Tea Party, Green Leaf Tea, Jasmine Tea, Black Tea, Buy Cheap Tea, Tea Bags, Buddha Bazaar. The bio-diverse tea plantations in the Kangra Valley of Himachal Pradesh were born in the lap of the Mighty snow-capped Dhauladhar ranges of the Indian Himalayas. This spectacular flavor of freshly brewed green leaf tea and its darker ripened version of black tea became an easy favorite with the Tibetan Tea House flavors. 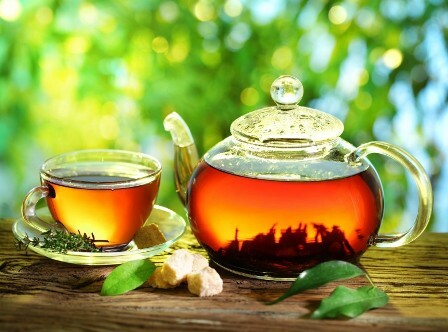 In Dharamsala herbal tea is very popular in its many forms of Indian tea, Chinese tea, Flower flavored Jasmine tea and traditionally made Medicinal Tea. 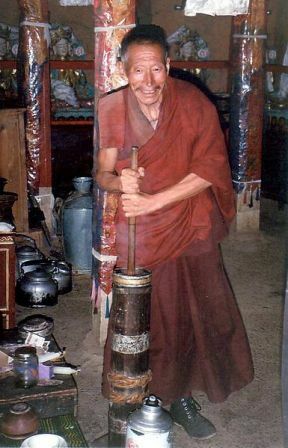 With the advent of His Holiness the Dalai Lama and his Tibetan people who traveled over the high mountains, the ancient knowledge of Tibetan Tea Benefits, became a common life style statement in Dharamshala India and around the Globe. Drinking Himalayan tea is a regular part of the Tibetan life. 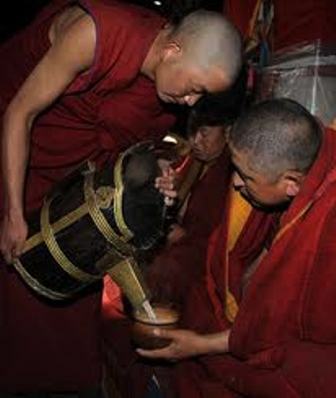 The nomads in its origin developed the high caloric energizer popularly known as 'Butter Tea'.Till today it remains a favorite monastic drink with the monks and Tibetan nomads. From the harsh chilly winters of Tibet to the sunshine Shangrila of the Himalayas, this Himalayan tea recipe from Tibet gained popularity with the traveling monks, the nomads and the common people.
" High quality tea leaves are boiled in water and brewed for a long time till the brew achieves a dark brown color. It is then skimmed and pored into a cylindrical churner with fresh butter and salt and then shakened and churned properly. The tea is then poured into tea-pots and then served in Tibetan tea bowls. On our online shop - Buddha Bazaar, you can order your special pack of Black tea for this cultivated tea flavor. " Over time, with the heritage healing knowledge of Himalayan herbs n spices many different flavors from the tea house found their way in our modern homes. The different tea flavors from Tibet can be found in various packs in the streets of Dharamsala. This packaged tea can be brewed like Indian or Jasmine tea and enjoyed in its various forms..!It is famous for its healing properties. 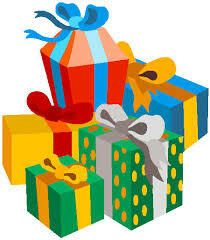 This New Year gift your dear ones a good health Drink from our Tea selection ! HIMALAYAN TEAHOUSE FLAVOR. THIS TEA CAREFULLY BLENDED WITH PURE NATURAL HERBS IS POPULAR FOR ITS TEA BENEFITS. IT HELPS TO RELIEVE STRESS AND CURES COLD AND SORE THROAT. THIS HERBAL GREEN LEAF TEA ALSO HELPS AS A DIGESTIVE THIRST QUENCHING DRINK. DIRECTION TO USE: THIS TEA CAN BE TAKEN AT ANYTIME. 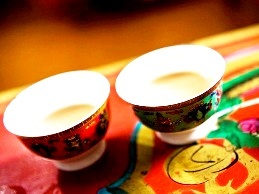 POUR HOT WATER IN TIBETAN TEA CUP WITH THE TEA BAG AND LET IT DIFFUSE FOR A WHILE TILL IT DEVELOPS ITS AROMA AND FLAVOR. THIS HIMALAYAN HEALTH TEA FROM DHARAMSALA INDIA, HAS ALL THE TEA BENEFITS FOR THE BODY. THIS HERBAL TEA LIKE ANCIENT CHINESE TEA IS FAMOUS FOR PROMOTING OVERALL BALANCE IN THE BODY ENERGIES AND CALMING THE NERVES. WILD ROSE PROMOTES STRENGTHENING OF THE HEART TO COPE WITH EVERYDAY STRESS. DIRECTION TO USE: THIS TEA CAN BE TAKEN AT ANYTIME. POUR HOT WATER IN TIBETAN BOWL WITH THE TEA AND LET IT DIFFUSE FOR A WHILE TILL IT DEVELOPS ITS AROMA AND FLAVOR. FROM THE ANCIENT SCHOOL OF TIBETAN MEDICINE, THIS BLACK TEA EYE NECTAR, HEALING TEA IS EFFECTIVE IN IMPROVING EYESIGHT AND RELIEVING EYE IRRITATION. Ingredients: Carthamus tinctorius, Carum carvi, Daucus carota, Zea may and Terminalia chebula. *Take as a plain black tea or add pinch of honey as per your taste. LIKE HERBAL INDIAN TEA THIS TEA IS CAREFULLY BLENDED WITH PURE NATURAL TRADITIONAL HERBS. THE TEA FROM BUDDHA BAZAAR ONLINE SHOP, HELPS IN CURING DIGESTIVE BALANCE TO THE BODY AND CUTS DOWN EXCESSIVE FATS N SALT. NO REPORTED TEA SIDE EFFECTS. Ingredients: Rubus hoffmeiteriannus, Symplocos paniculata, Cuminum cyminum(Caraway), Camellia theifera(Tea leaves), Rosa bronunii(Wild rose), Carthamus tinctorius(Safflower), Mentha sylvestris(Mint), Glyrrhiza glabra(Liquorice). Direction of Use: THIS HIMALAYAN TEA RECIPE FROM DHARAMSHALA INDIA, IS A REFRESHING BEVERAGE IN THE AFTERNOON OR LIKE JASMINE TEA, IT CAN BE TAKEN ANYTIME OF THE DAY. POUR HOT BOILED WATER IN TIBETAN TEA BOWL WITH TEA BAG. INFUSE FOR A FEW MINUTES TILL YOU GET DESIRED RICH COLOR AND AROMA. RELISH IT PURELY OR WITH LITTLE HONEY. For Your Own Kangra Tea, Special Cup of Herbal Tea..Click here ! 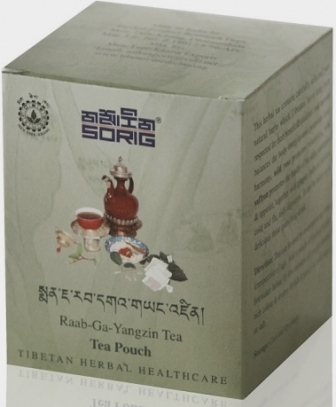 Special Tea House Flavors and Accessories from Tibet..Contact us at..